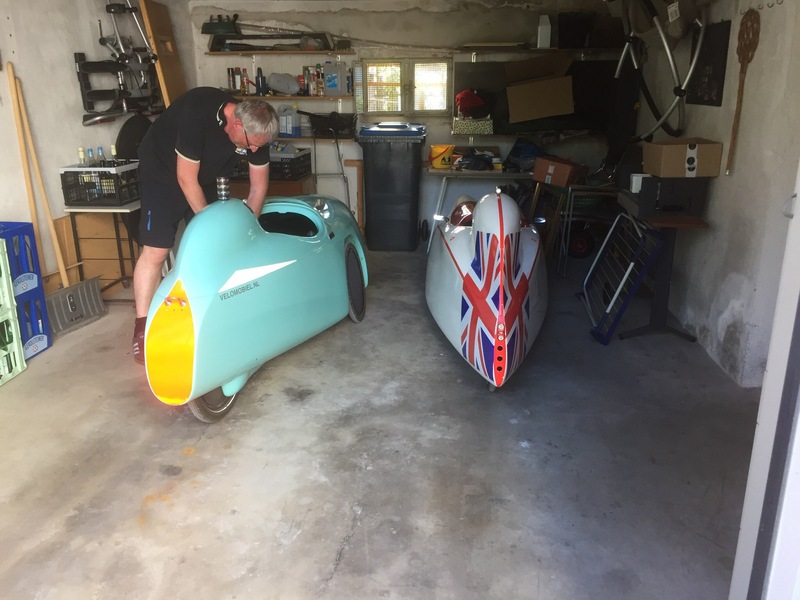 Despite having toured long distances on my trikes over the last nine years, I have only done one multi-day tour in a Velomobile which was my two day trip to Millingen aan de Rijn in Penelope two summers ago. However, this state of affairs is very much changing within three weeks, starting with a four day tour over the Christi Himmelfahrt (Ascension Day) break and then after a six day break (one week of work) then a two week tour to Usedom and Berlin and back. Almost 1700km in total. So, Christi Himmelfahrt. 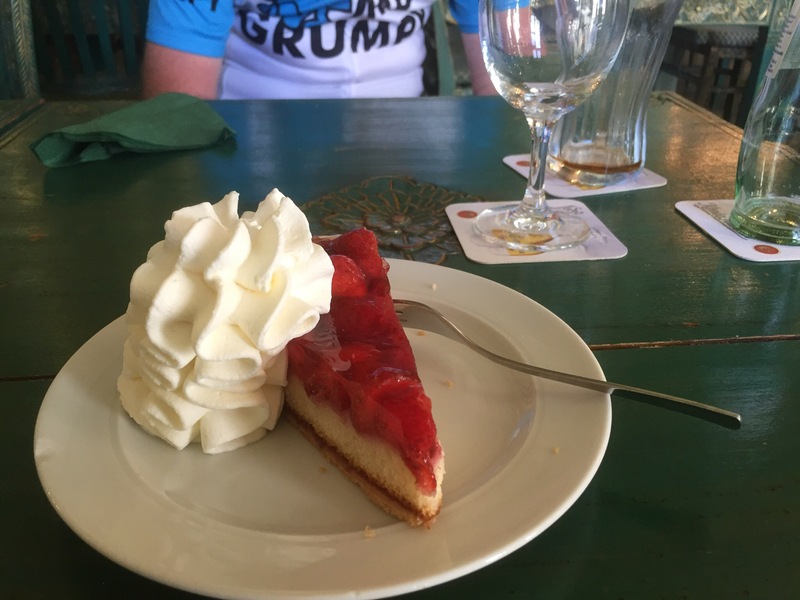 Klaus and I decided a short tour would be good, especially as the Trike Treffen was taking place in Bad Bentheim, 130km to the north. That seemed like a plan. 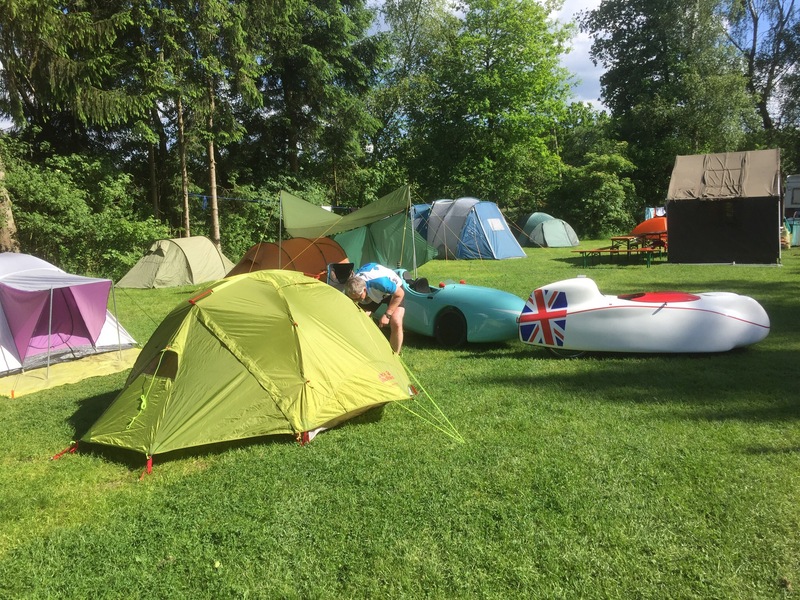 Trike Treffen involves camping and despite not having camped for 31 years, I decided to give it a go. So over the months leading up to the tour I purchased an isomatte (sleeping mattress), sleeping bag, super lightweight towel etc. 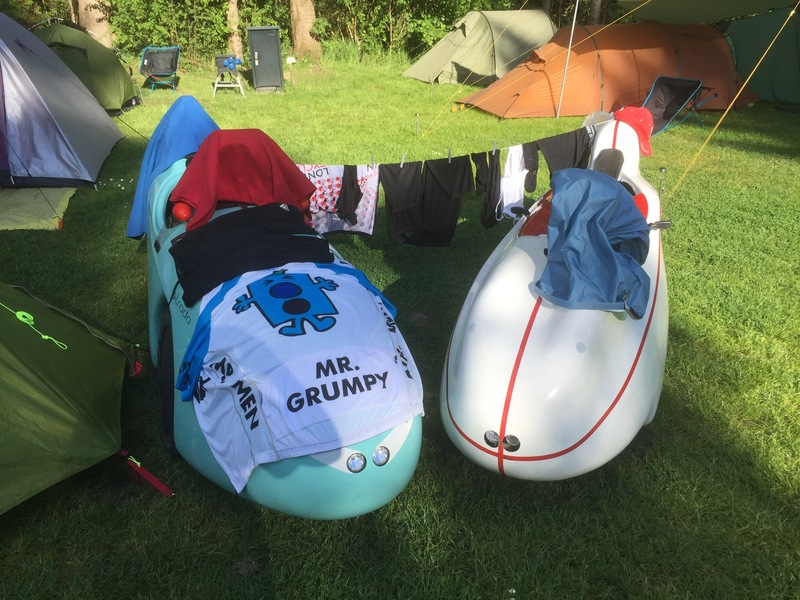 I also bought a selection of Karrimor dry bags to help fit my belongings in Millie who isn’t exactly designed as a touring Velomobile. We decided to extend the riding a bit so after one night at the campsite to ride to Soest, a beautiful old town to the east, and stay in a hotel there. Klaus has a good friend who lives there so we could visit him. For the journey back we planned to split it in two at Haltern am See, camping again. The day dawned with a fantastic weather forecast, 23 degrees for the Thursday but quickly rising to 28 degrees on Saturday and Sunday. We managed to fit everything in the Velomobiles without any difficulty. We set off, heading first of all towards the Rhine bridge at Wesel but this involved going over the mega hill Tönisberg (20 metres!!) within 5km of the start. A rather rude warm up!! We had a really enjoyable ride, the extra weight in the Velomobiles only really noticeable when we were pushing them around before getting in (especially noticeable with Millie as she has no handle at the back). With the warm weather and despite the headwind the bikes covered the ground very well. We found the roads fairly empty of traffic and enjoyed the weather and scenery as we made our way towards the Rhein on familiar roads. In order to cross the Wesel we needed to get into the Rheindeich… and this involved a pair of Drängelgitter that we couldn’t negotiate awheel. However, a short break for walking is not a bad thing! 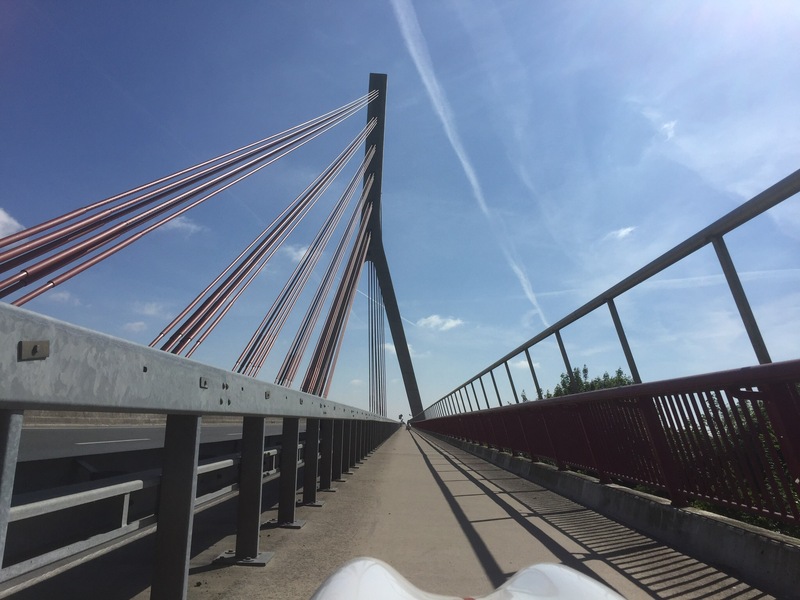 We then had the difficult entry onto the Wesel bridge with two hairpins which I cannot manage in one go with Millie’s turning circle but was able to shuffle back and forth and get round without too much inconvenience. The view as we crossed the bridge was lovely. and here is the view looking down on the Rhein. Now we had crossed the river we were heading into less explored territory. I was also tending towards needing the loo but we didn’t see many open bakeries. When we eventually found one it didn’t have a loo so we decided to ride further. 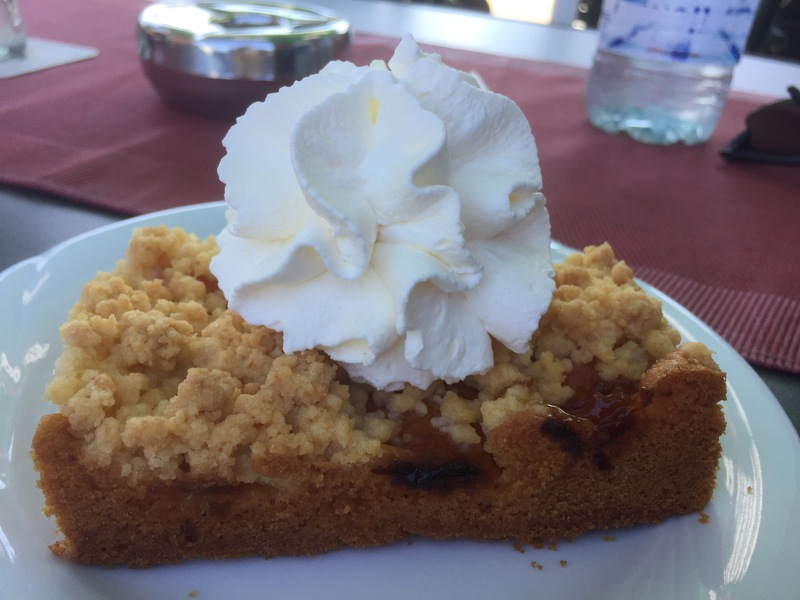 After 5-6 kilometres Klaus spotted a Biergarten beside the long, straight and fast B70 we had been zooming along so we decided to stop for a piece of Apricot Streusel. We enjoyed our cake and tea/coffee and water and the chance to relax for a bit as we had been making good progress. There was a group of motorcyclists there and they asked us how fast we rode as they had passed us in Wesel and were very surprised how quickly we had caught them up. 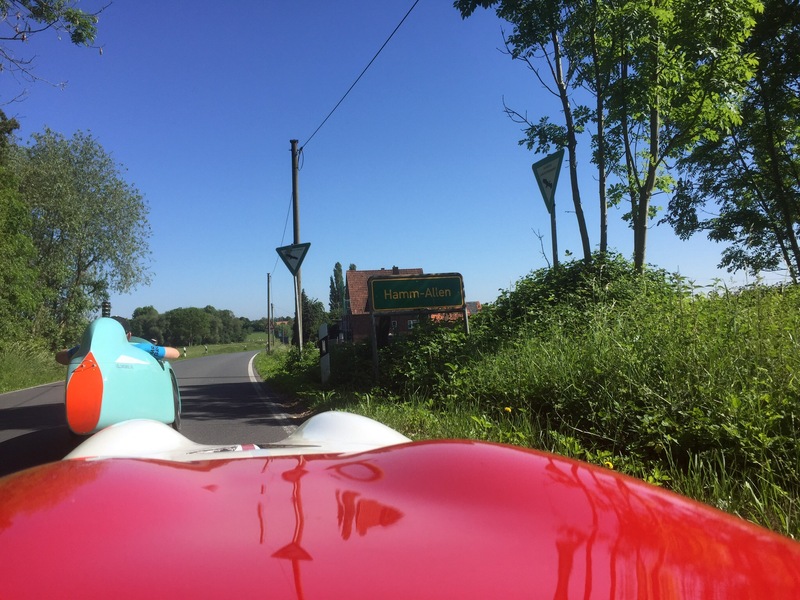 It was lovely to sit, relax and enjoy the sunshine, but the road was calling so after 45 minutes or so we got back into the Velomobiles and pushed on. We left the B70 after about 10km and headed onto a quieter Landstraße which took us through Homer and then around the edge of Borken. I saw signs to some familiar places – Südlohn and Stadtlohn. I remembered these place names from my Berlin to London tour many years ago. In Stadtlohn I wasn’t paying attention and went the wrong way, which involved cobbles and pedestrian areas before I managed to catch up with Klaus again. We were now heading to Ahaus and when we arrived it was time for some lunch (it is always time for lunch in Helenworld). We found cafe Muse and left the Velomobiles outside. It had interesting decor! 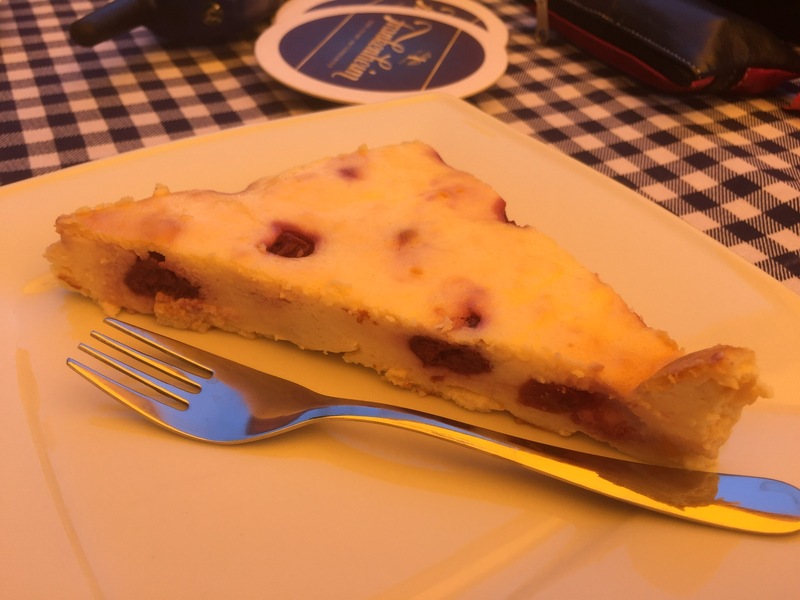 I enjoyed a schnitzel and salad but then found it impossible to resist a strawberry Schnitte – after all, fruit is healthy! We were sitting inside as it was cooler and we needed a break from the sun. You are very much exposed to the sun in a Velomobile and so we were wearing hats and sun cream etc. Klaus had slightly pink upper arms so we wielded some sun cream again. From Ahaus we cycled along the Landstraße L573 for a long time, sometimes on the cycle path but often on the road. The cycle paths beside the road weren’t bad in this sector but sometimes you can go faster on the road and there wasn’t much traffic. This road took us all the way to Ochtrup where we turned more north and crossed the border out of Nordrhein-Westfalen into Niedersachsen. The last few kilometres to Bad Bentheim had slight hilly tendencies but we were soon at the campsite between Bad Bentheim and Suddendorf. When we arrived we found the trike Treffen area but there were only a few people there – most were still out on the group ride. Klaus set out to put up the tent. 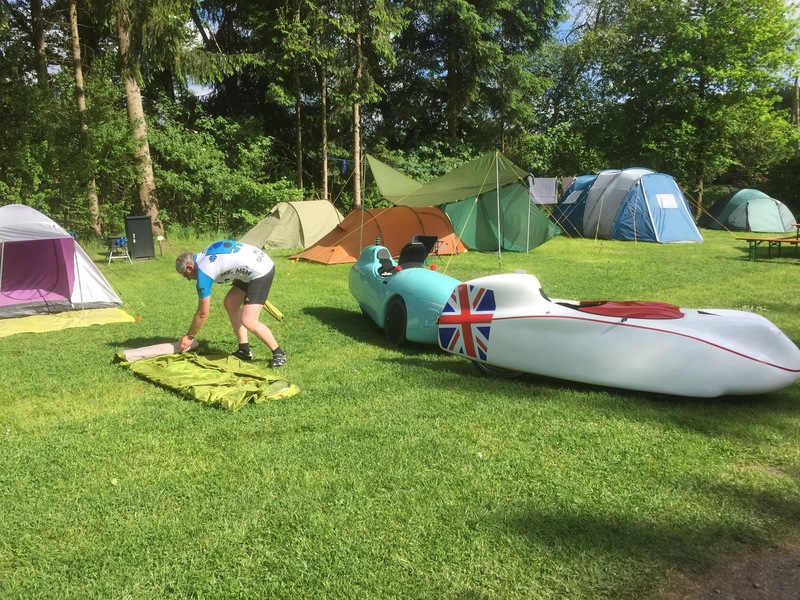 Once the tent was up I had a much-needed shower and then fashioned a Heath Robinson washing line between the two Velomobiles. Celeste has a handle on the back which I used but with Millie I had to fix the line to the Lichtkanone on the top. Not the best idea but it worked ok in the end. After about an hour the rest of the people arrived and we talked to lots of acquaintances. We had signed up for the barbecue where the food was provided but hadn’t realised that was just the meat, so our dinner was two pork steaks each cut up with the knife on Klaus’s multi tool and eaten off a plate we borrowed from someone. A real low carb meal! After Dinner I was so tired that I went into the tent and tried to get to sleep. However, I discovered why people said you need ear plugs when camping – the conversations of others kept me awake. I also found it difficult to get comfortable in terms of temperature – I think actually I was a bit dehydrated. Anyway, I didn’t have a brilliant night’s sleep but will be better prepared next time! The total day’s distance was 143.64km at an average speed of 25.5km/h and I burned 2,671 calories. We were awake and ready to leave by 8:30am with the tent packed away. 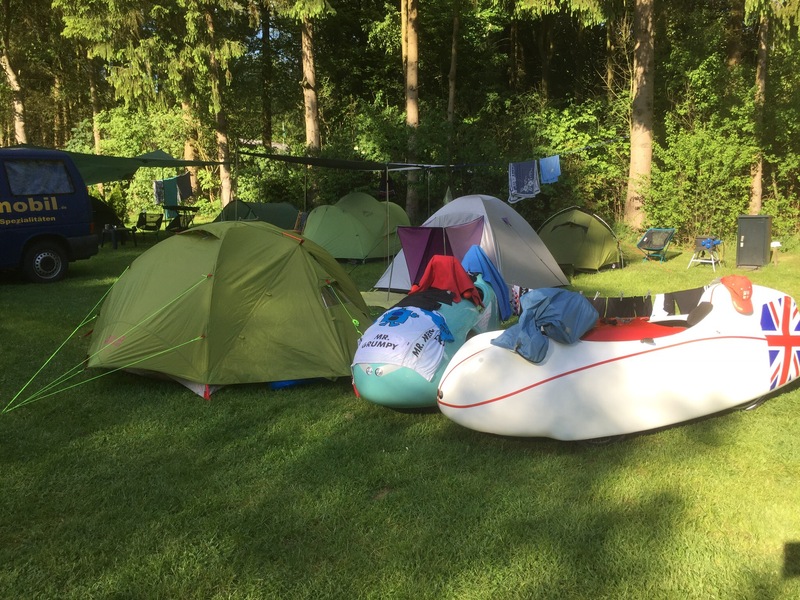 Our washing was still damp (mainly from dew) so we packed it away in plastic bags and set off towards Soest. First plan of the day was to find somewhere for breakfast. There was a man siting outside chatting to everyone who passed and we had a good conversation with him. Of course he talked to me about Brexit – the flag on Millie rather gives away my nationality. We set off after a leisurely stop and headed towards Emsdetten. There were some long stretches which meant we could get the speed up nicely – what I have noticed with Millie is that she is definitely better in the long distances. Because I only really have one power setting, it takes me a while to get up to speed, but Millie rolls so well that once I am up to 35km/h I can sit at that speed without expending much effort. At one point when going over a bumpy bit I heard a pinging sound as if a stone had jumped up through the foothole and was crashing around a bit inside. I didn’t think much of it, but then during a lovely downhill when I was in my top gear the chain suddenly jammed. This was very annoying as I had to stop. It soon became apparent that my Schlumpf button had fallen out again – and it was the one from the other side! I walked back down the road but couldn’t find it. Then Klaus, trying to free the chain, realised the button was actually stuck in my chain tunnel and rescued it. I was relieved to still have it (as I didn’t have the spares with me) but without its mini allen bolt it wouldn’t stay in for very long. So for the time being I put it in my bag for safekeeping and carried on, hoping not to have to experience too many steep hills. 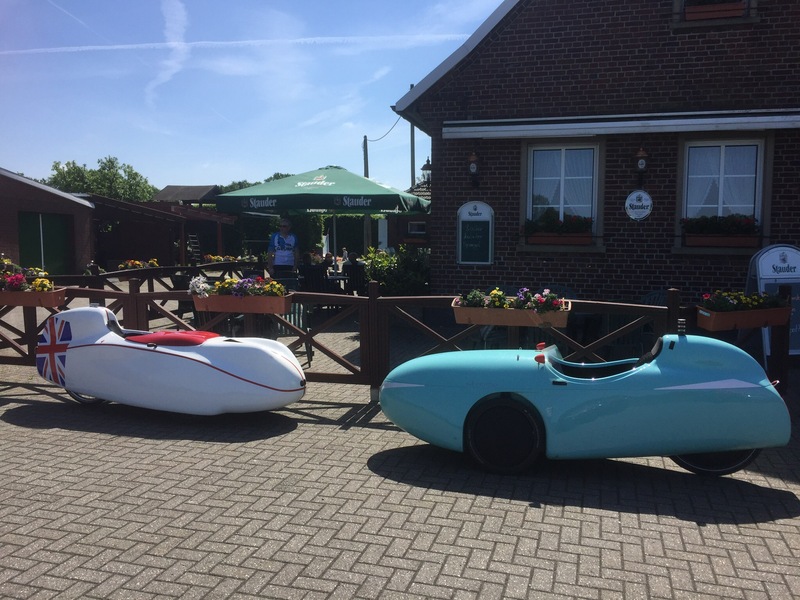 The day was warming up but when you ride with enough speed the Velomobiles create enough draught that it is cooling. With Millie, anything above 25 km/h provides plenty of cooling, especially as I have a Naca duct (air intake). However, hills at a slower pace mean it heats up quite a lot inside, as does sitting waiting at traffic lights. Again the roads were pretty clear and we were whizzing along. 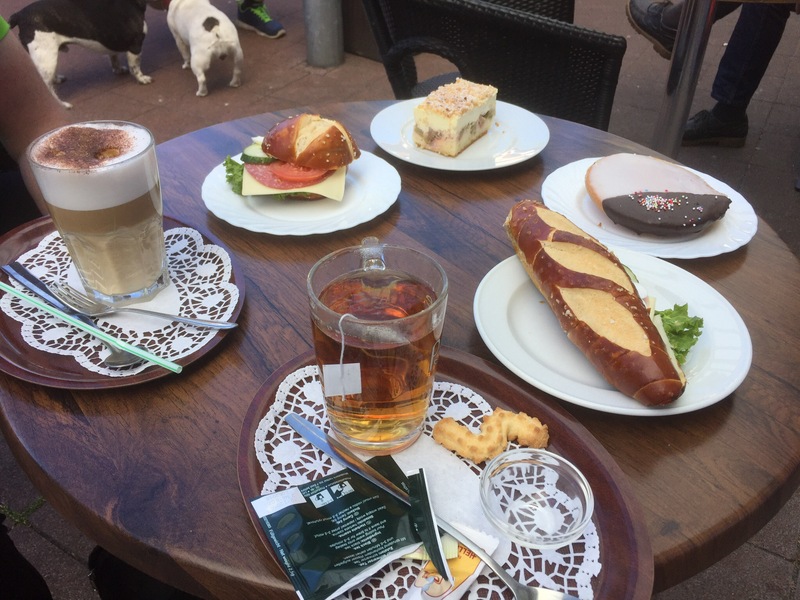 It was getting towards time to stop to refresh the water supplies so when we arrived in Sendenhorst, a reasonably-sized town, we decided to go off route and find somewhere to eat. 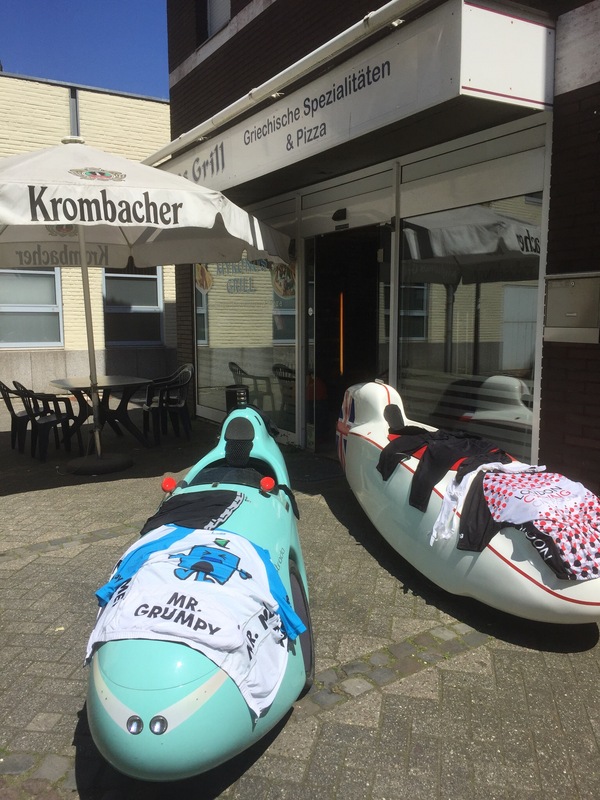 We found a Greek restaurant and stopped, laying our wet washing on the velomobiles to dry in the sun. The staff in the restaurant were super-friendly, chatting to us about the bikes and photographing them, sending the pictures to relatives in Greece. 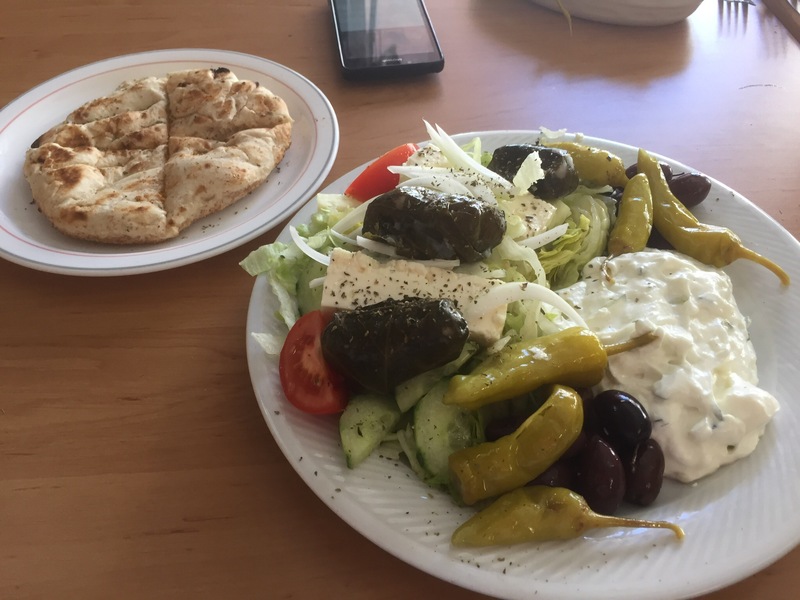 They also offered some very nice food – I had this great cold platter. I asked to buy some cold still water and they gave me water that came from Greece. Because I was thirsty I tried to buy some more but in the end he gave me three bottles completely free of charge, which was very sweet of him. The whole cost of our lunch stop was extremely reasonable – Klaus’s litre of coke was about 2 Euros. Once we had finished our lunch we discovered our clothes were pretty much dry so we packed everything away and headed off again towards Soest. We skirted around Hamm and then started heading towards Soest on roads that were a bit more rolling. I had decided to screw my Schlumpf button back in and decided to keep checking it was done up – I really needed the extra gears and it wasn’t doing me any good in my bag. So I was able to Schlumpf for the hills on the way to Soest but they weren’t too bad. Klaus was a bit nervous I think about my speed when the hills start as he knows I don’t like them but with the high speeds we were riding it was mostly OK and I enjoyed it. Just as we were going down the hill into Soest my Schlumpf button popped out again but it landed in the foodwell and I grabbed it. We found our way to the hotel which was the oldest guest house in Nordrhein-Westfalen, from 1307. Hotel Pilgrimhaus had really friendly staff. I realised I was pretty dehydrated from the heat so spent the next few hours drinking lots of water but having very little output. This was a reminder that when riding velomobiles you maybe don’t feel the heat as much but the wind is wicking away moisture all the time. I resolved to be better with my drink planning the next day. There was no storage space for our velomobiles but this wasn’t a problem as Klaus’s friend said we could store them in his garage so we rode there after our showers and he drove us back (it was just a mile), joining us for dinner at Hotel Pilgrimhaus. The total day’s distance was 129.21km at an average speed of 23.8km/h and I burned 2,429 calories. The food at Hotel Pilgrimhaus was fabulous but I didn’t remember to photograph it (I was too keen on eating it!) 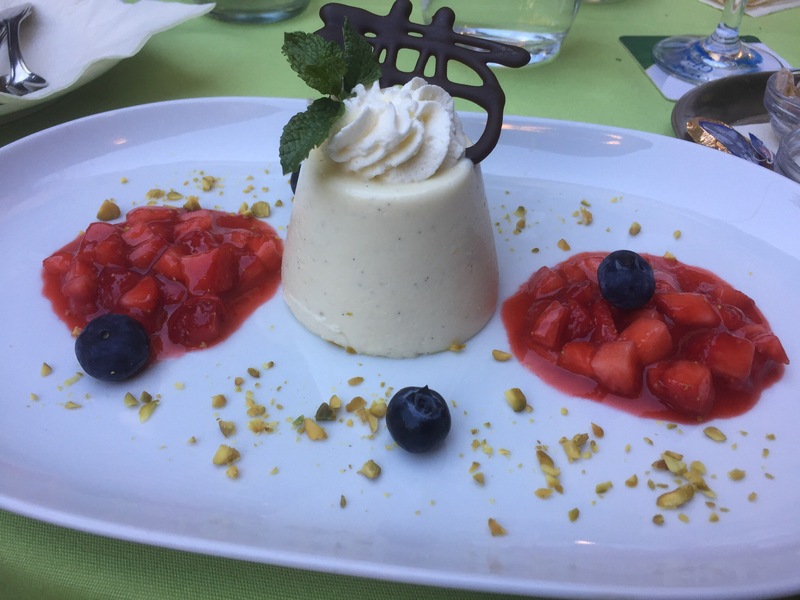 except for the dessert, a white chocolate Panna Cotta. Lovely! I was really really tired after my poor night’s sleep the day before so went to bed early and left Klaus chatting with his friend Dirk for a couple more hours. I went out like a light, enjoying a comfortable room and the peace and quiet without lots of other campers talking! Our original plan for today was to ride to Haltern am See and camp there for the night. However, due to my less than ideal camping experience on Thursday night, the weather forecast (super-hot), and the fact that 82km seemed way too short for a day’s ride, we considered riding all the way home instead, 162km. We didn’t know how we would feel riding in 30 degree heat but decided to give it a go. We would stop between 2pm and 5pm when the temperature is highest and would also ensure that we regularly drank lots of fluids whilst riding. 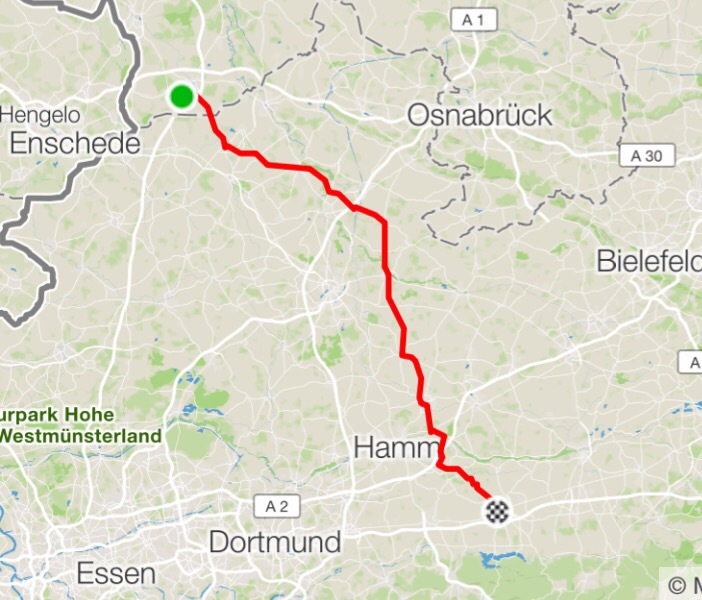 Here is our track for the day – as you can see, we did end up riding the whole way home. We enjoyed an excellent breakfast at the hotel and checked out by 9am. Dirk was there to collect us and take us to his garage where we collected the bikes. Then it was time to head towards Haltern and maybe home. The route out of Soest was absolutely beautiful – rolling hills, everything very green, few cars. I had been a bit concerned that I still wasn’t peeing much after my dehydration yesterday so I drank a litre of water just before we set out. Clearly by this point I had actually replenished my water stocks as after riding for about 10 minutes I was desperate for the loo. Klaus was far ahead and I had forgotten to get my radio ready and I couldn’t wait till I could catch up with him so nipped into a side road and made the most of rather sparse tree cover. Fortunately no-one came along! Klaus waited for me a bit further on and I ensured I had my radio on after that. We had a lovely ride, really enjoying the scenery and the great road quality, except for one very disappointing downhill. It was curvy and fast but suddenly the road surface became awful! I had to brake from 50 to about 20 as it was so rough. Klaus, who was ahead, wanted to get on the radio to warn me but needed both hands on the tiller to hang on for dear life! We made it to the bottom, amazingly with my Schlumpf button still in place, and decided to stop shortly after for a scheduled drink spot. I had decided to ensure I drank a bottle of water every 25km. We stopped at a car park area which happened to be at a cemetery so Klaus found some fresh water after we had drunk ours. I also found a convenient hedge for a loo stop again. It wasn’t too fiercely warm yet but the sky was blue and we could see we would soon be feeling the heat. We went on, riding mostly on the roads as there were few cycle paths. It was a beautiful day. We were keeping to our drinking schedule and going well. 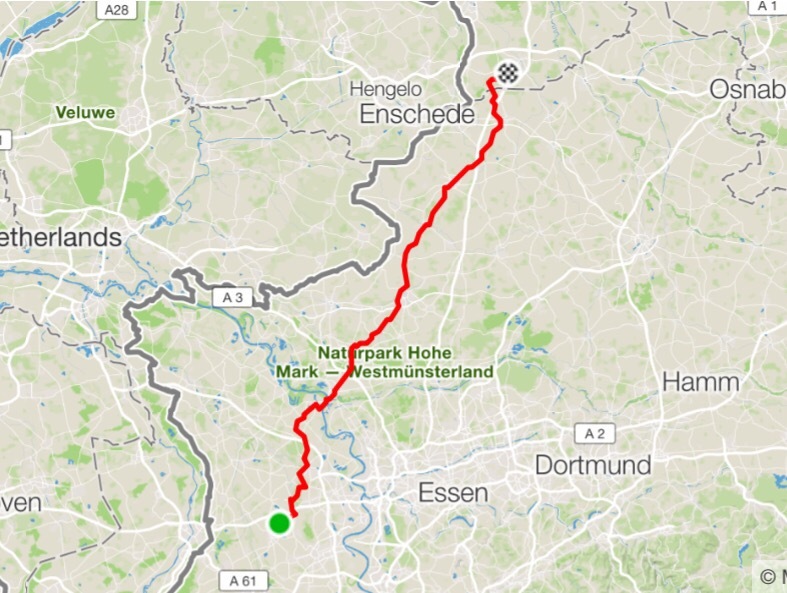 The plan was to ride to the campsite at Haltern am See but we realised that was a bit of a detour so could cut off about 5-10km if we decided to push on to Kempen. I had radioed Klaus to say I wanted to stop for water at about 60km but we were on such a lovely road I kept going – cruising at 35km/h you cover so much ground it seems a shame to stop! He had slowed a couple of times for potential stops but I kept going. When we turned off the fast road I said we could now have our drink stop but Klaus’s Biergarten radar spotted something just up the road so we found ourselves at a campsite with beer garden near Datteln. We stopped and had a cuppa and a piece of cheesecake each. We had 100km to go from this point and we discussed whether we should stay there for the heat but it was only midday so I thought it worth riding a bit further (the main heat hits at 2pm), plus I wanted to be more than halfway when we did our long stop. So we continued on after a good break, having refilled our water and eaten some salty peanuts to refresh our electrolytes. The route followed the Lippetal canal and was very interesting. We weren’t on our official track because of the detour to shorten the route but soon joined back up with the official route at Haltern. We were now looking out for our longer stop location as it was 2 o’clock and very hot, but didn’t find a suitable looking place. We went through the village of Lippramsdorf which had some hotels with garden terraces but Klaus kept going. 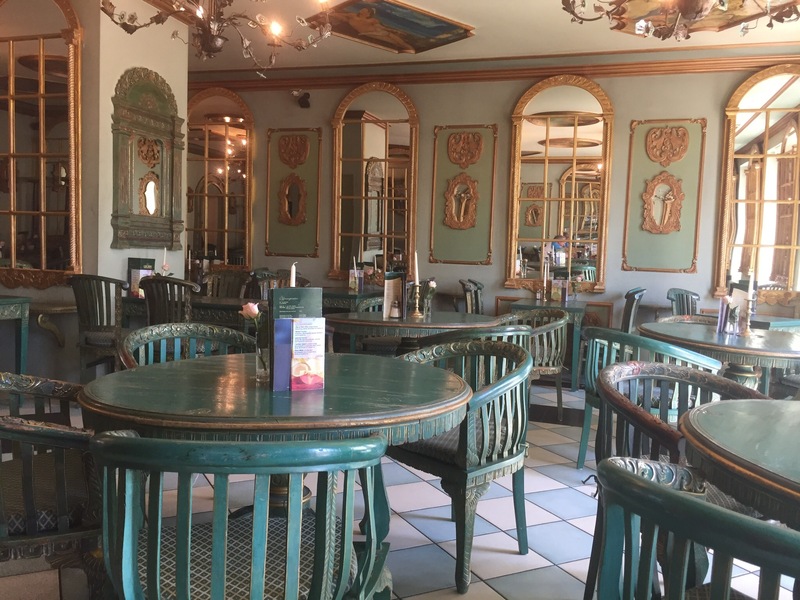 Halfway between Haltern and Dorsten he spotted a sign for a Hofcafé – and really hit the jackpot! This was a brand new cafe with some wonderful cakes and nice comfy seats outside with sunshades. 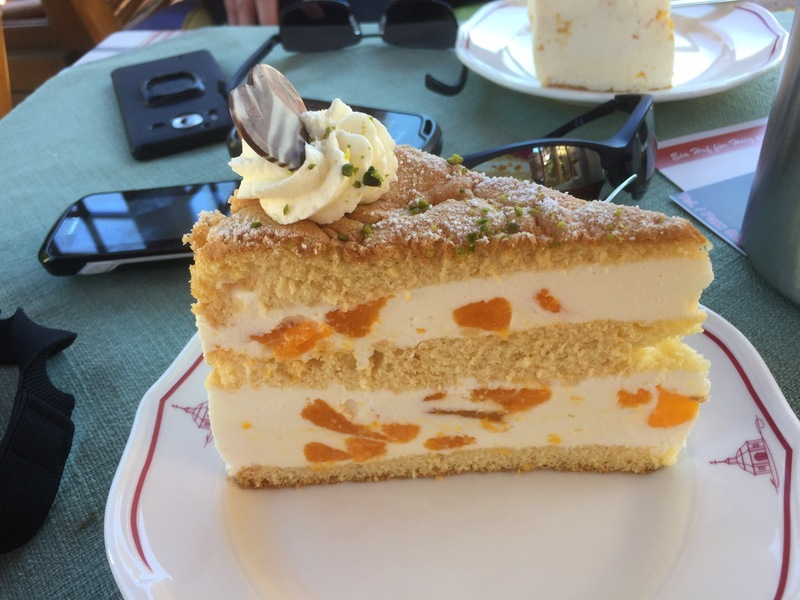 The lady serving us was very nice and we spent two hours there, eating an enormous slice of Käse Sahne torte and drinking tea/coffee, watching the other guests (including a big group of bikers) and generally enjoying the peace and relaxation. However our plan to stay there till 5 or 6 seemed a bit of a waste of time as it wasn’t getting any cooler so in the end we left at 16:15, ready to get back on the road and complete the final 75km to home. With refilled water bottles we set off again, riding through Dorsten (which was rather traffic-lighty) and then through Kirchhellen which had the most wonderful downhill towards Dinslaken. At this point our average speed for an 8km stretch was over 30km/h! 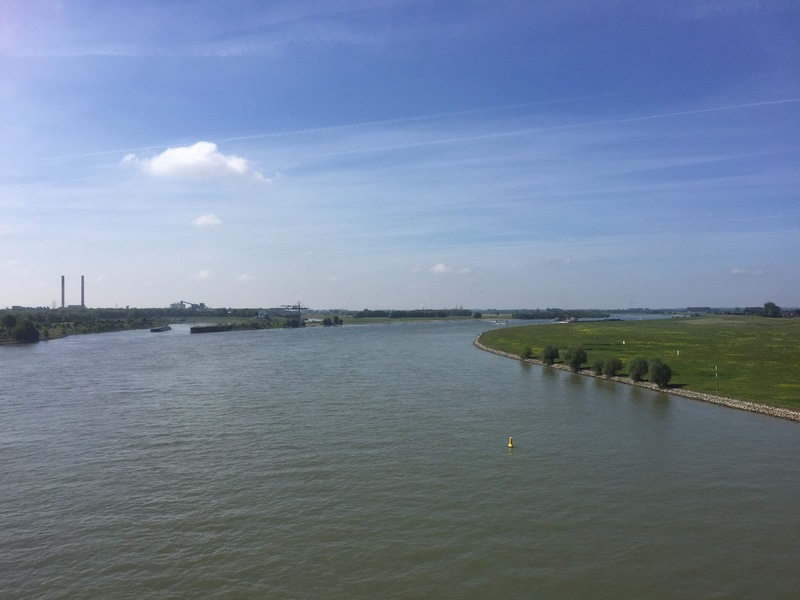 From Dinslaken we headed to Duisburg-Walsum where our Rhine crossing (a ferry) awaited us. Klaus began to feel he had low energy so we stopped at a Netto for him to buy some supplies – a bread roll each and he had a litre of buttermilk which he drank neat and it gave him his energy back. Whilst he was in Netto lots of the locals were asking me about the bikes – they had never seen anything like them before. From Walsum it was a short ride to the ferry and we ate our bread rolls during the short Rhein crossing. Once on ‘our’ side of the river we were definitely on the home stretch and zoomed towards Moers, Neukirchen Vluyn and then round Siebenhäuser back to St Hubert, averaging 29km/h for the last 22km. We got back at 19:15, unpacked the bikes and then Klaus tipped a whole bottle of water over his head to cool down! Gudula and Frank were having a barbecue so we ate with them which was very handy as I had no food in the house, not expecting us to be back until tomorrow! Today’s distance was 161.72km (that’s a shade over 100 miles) with an average speed of 26km/h and I burned 2,627 calories. All in all it was a fabulous tour. 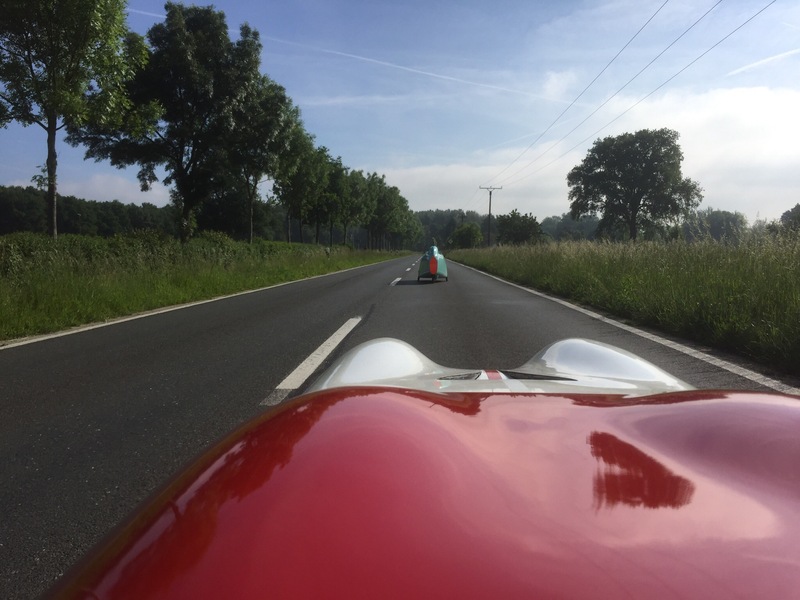 Millie is a much better touring velomobile than I had expected and her speed really eats up the distance. I need to fix the Schlumpf button before we start the Kempen-Usedom-Berlin-Kempen tour in a week’s time but I will sort something out – worst case scenario I will use threadlock or superglue on the current button. With velomobiles you can ride a lot further each day which increases the visiting distance. I would like to do some more two day tours, perhaps with camping, in the Netherlands and north of here, so we can see some new places and ride some new roads. It’s all such fun! Another charming bit of vicarious cycle touring – sitting in a rainy front room in Cardiff !